Fill the wells of Vitri Plate with 300µℓ ofES and 300µℓ ofVS. Put the lid on the Vitri Plate immediately. Observe the oocyte/embryo well and remember each perivitelline space to know the full recovery volume of then duringES. Aspirate the oocyte/embryo at the tip of pasteur pipette. Put the oocyte/embryo with a small amount of medium on the surface of theES. Start counting up by the stop watch. Cover the Vitri Plate with the lid, and wait for the full recovery from the shrinkage. When the oocyte/embryo volume is completely recovered, ES equilibration ends. 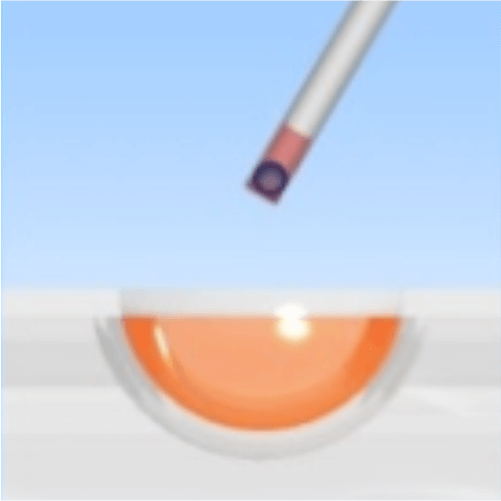 If you can't confirm the recovery completely, the limit time ofES equilibration is 15 min for the oocyte and blastocyst (160-220 µm in diameter), and 12 min for 4 - 8 cells embryo. 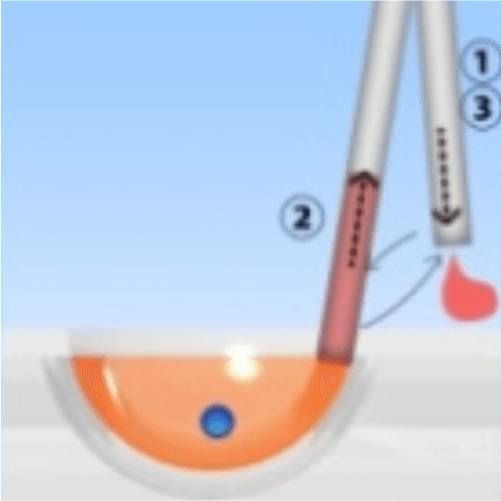 Aspirate the oocyte/embryo with a small amount of ES at the tip of the pipette･. Place the oocyte/embryo in mid depth of VS1(Step 1). 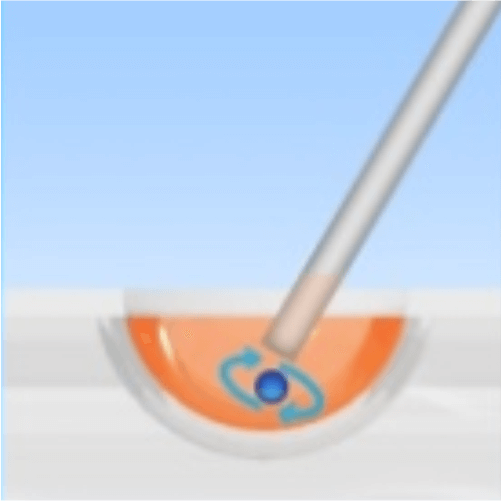 The Oocyte/embryo will float immediately to the surface of VS1 (Step 2/4). After aspirating fresh vs from the edge, aspirate the oocyte/embryo at the tip of the pipette. Place now the oocyte/embryo again to the bottom o fVS1 (Step 3). The oocyte/embryo will rise to mid depth and will stop (End of VS1 equilibration, Step 4). Rinse out the pipette expelling the VS1 left inside, aspirating and expelling fresh VS2. Aspirate VS2, followed by oocyte/embryo in VS1 at the tip of the pipette. Place the oocyte/embryo to the mid depth of the VS2 (Step 5). Aspirate fresh VS2 from the edge of the well, mix the solution around the oocyte/embryo, and observe the complete shrinkage of the oocyte/embryo (Step 7). 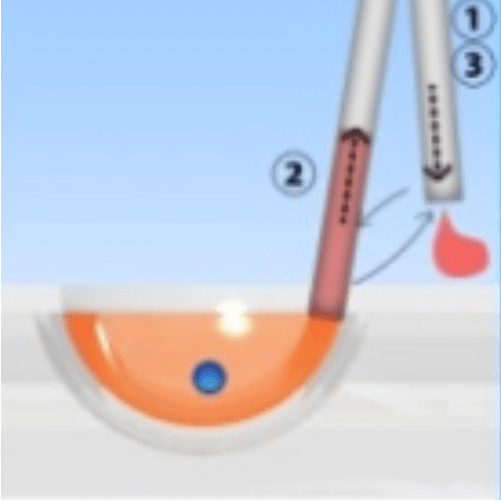 Take the oocyte/embryo ａt the tip of the pipette (Step 8). 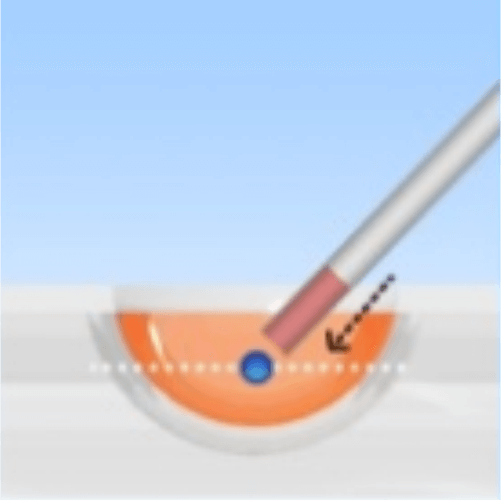 Place the oocyte/embryo near the black mark on the Cryotec sheet with small volume of the VS2. (1 oocyte/embryo per droplet is recommended. Immediately submerge and stir the Cryotec in fresh liquid nitrogen. Put the cover cap on the Cryotec inside the liquid nitrogen.